It’s so embarrassing writing about yourself, so I found and interview I did, which is a way better depiction of us, and what we do, and why we do it. 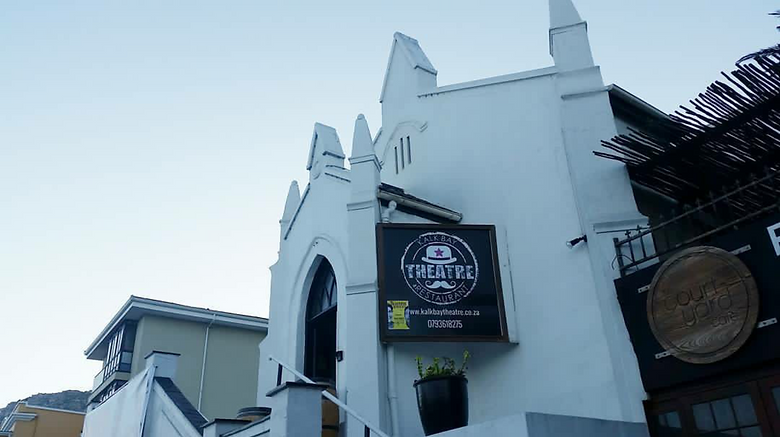 Anyone who has ever visited Kalk Bay Theatre knows that it is a unique space, not only because it is a deconsecrated church, but also because this beautiful, intimate theatre space is owned and managed by a couple that live and breathe all things entertainment. Vanessa Harris and Ashley Searle, who also own the Follow Spot Productions company, have made the Kalk Bay Theatre and Restaurant an extension of their vibrant personalities. Sitting down to talk with Harris about their journey and the inspiration behind Kalk Bay Theatre, she smiles from ear-to-ear as she shares memories about how it all came to be that she can now call this much-loved theatre home. The word serendipitous comes to mind as I listen. A lot of that what makes this unexpected, natural progression of becoming theatre-owners work, is the dynamic that characterises their relationship, as well as the way their personalities complement each other, both as a couple and as creatives. “The thing is for me, I’ve always been the kind of person that if I’m sitting still and there is nothing really going on, I’m bored. That’s not my happy place. Ashley always jokes that I’m the kind of person who once we get in the car from the Grahamstown Festival – literally as we slam the door, getting onto the N2 – starts planning the next Grahamstown, the next show, the next thing. I never stop thinking. [Ashley] is the one who wants to sit back and relax. But it’s good, a nice combo. We balance each other, a little bit of yin and yang there. So we run it all 50/50, but I’m the sort of overactive one and he’s in the background being my shadow going, ‘Vanessa, don’t go too wild, Vanessa, relax’”, Harris shares with a glint in her eye. That quirky, balanced, middle ground where the Risk-taker and the Vanessa-whisperer meet is then also where the inspiration for the shows they create and choose for their theatre line-up come from? The magic that draws people to their Kalk Bay Theatre offerings? Although you may then not find Hamlet at Kalk Bay Theatre any time soon, if ever, you can be assured that Harris and Searle are always mixing it up, testing the waters, and giving the theatre community of Cape Town something different in their vibey space. That high-energy approach to living their theatre passion is a big part of why Harris and Searle are making such a success of Kalk Bay Theatre. After all, theatre needs life and they make sure that a lively atmosphere is always rippling through the building, and their patrons love it! It is because Harris and Searle embrace theatre as such a special space that they have also invested much of their time and energy in establishing Follow Spot Productions as a trusted brand people feel they can invest in when buying a theatre ticket. If you haven’t walked through Kalk Bay Theatre and Restaurant’s inviting doors yet, to indulge in their restaurant’s delights and embrace the escapism they offer when you take a theatre seat, I can promise you that once you have do, you will be back very often to visit with Harris, Searle, their friendly restaurant staff and the amazing performers who grace the stage of their home.